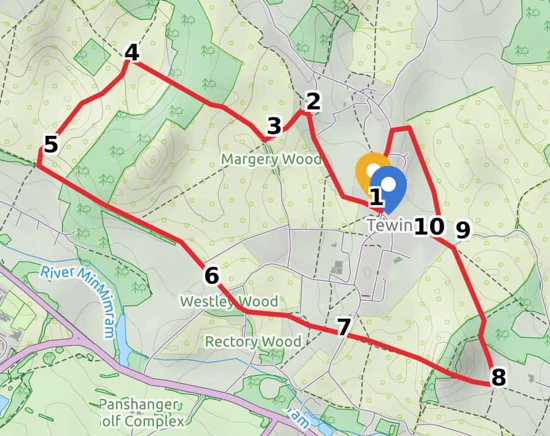 This is a pleasant circular walk from the village of Tewin that loops first west, then south and east before returning to the start of the walk. Good paths throughout and some fairly decent ups and downs. Park near the village green in Tewin, walk towards the Rose & Crown and, just before you reach the pub, head west then north-west along Back Lane. After a pond on your right, turn left and head south-west until you reach a footpath crossroads. Here you turn right, and climb up hill heading north-west to Dawley Wood. Continue through Dawley Wood until you reach the clearing on the other side and a steep drop downhill. Soon you come to another footpath crossroads. Turn left and continue south-west until you reach a third footpath crossing. Turn left again and head south-east uphill, through the woodland and then down along a wide track. Continue until you reach Churchfield Road. Walk across Churchfield Road and follow the path into the woodland beyond. Continue along this path, past another footpath crossing, and continue east, through the churchyard, past the old church, and out into the field beyond. Continue along this path heading east to Archers Green Lane. Cross the lane and continue down the path heading east through Lamb Dell Wood. After Lamb Dell Wood you enter open fields. Look out for a path on your left heading north. Take this path until it renters the wood again. At the other side of the wood the path enters an open field and climbs the hill to Hertford Road. Turn left along Hertford Road, looking out for a path on your right immediately after the first house on your right. 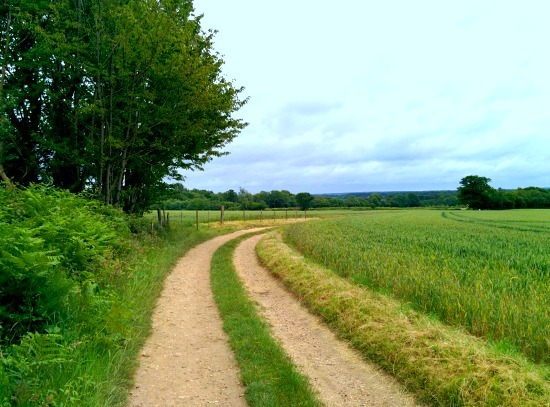 Follow this path around the back of the houses as you head north before turning left and west heading back to Hertford Road in the village of Tewin where you turn left and head south back to the car.